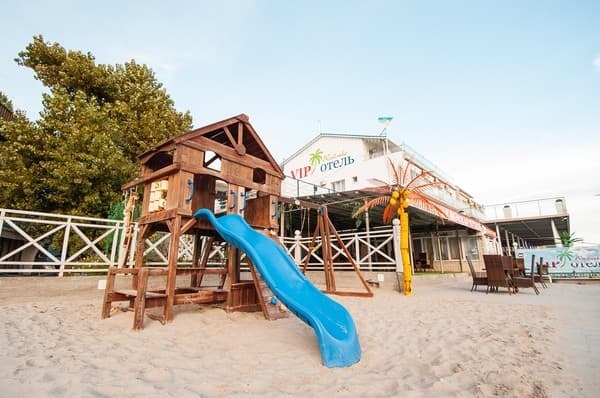 "VIP-hotel" is a complex consisting of two buildings, located 25 meters from the sea, that is, with the exit directly to the sandy beach. 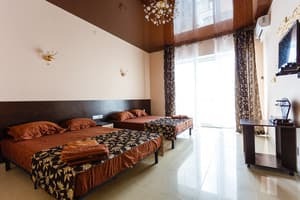 Guests are offered spacious comfortable single and double rooms. The buildings are modern European style. 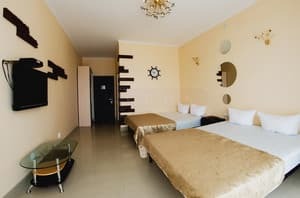 It offers air-conditioned rooms and apartments with free Wi-Fi, a flat-screen TV, a fridge, a kettle, a safe and a balcony or terrace. 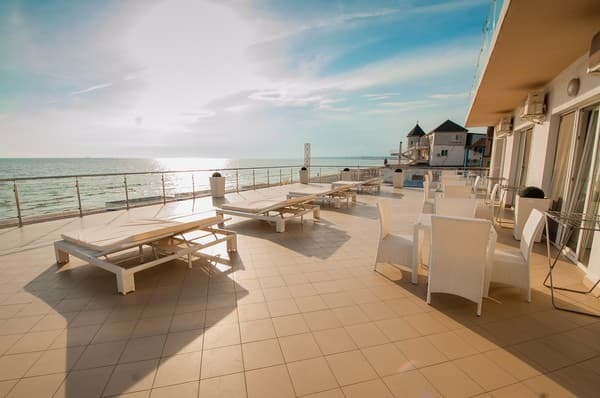 The cafe and terrace of the hotel "VIP" serves dishes of Ukrainian cuisine. 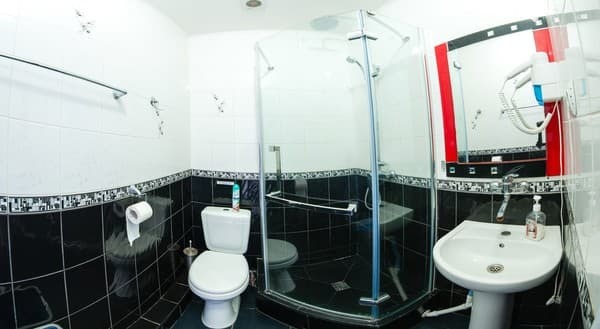 Description of the room: "Lux" is a one-room suite with all conveniences (hot and cold water round the clock). The room is designed for 2-4 people. 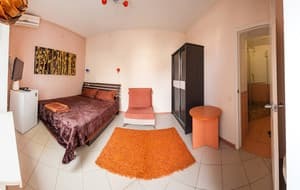 Description of the room: The apartments include 2 rooms with a total area of ​​33 square meters. m: bedroom area of ​​13 sq. m. m; Living room area 15 sq. m. m. There is an extra bed in the form of a chair-bed. Сподобалося,що готель на березі моря, чистий пляж, чисте море. Отель на берегу моря, 1 линия, великолепный вид. Хорошая инфраструктура. Наличие на 1 этаже собственной кухни + бар. Собственная стоянка (входит в стоимость проживания). Наличие небольших тренажеров на 1 этаже( понравилось детям). Шезлонги, лежаки на прокат (20грн. за штуку). Есть детская площадка. Парень (Ваня) который за всем следит просто молодец ( трудолюбивый). Номера большие. Отдельно у каждого свой столик со стульями. Есть урны и мусорный бак. Территория ухожена, благодаря Ване. Пляж чистится каждый вечер тоже Ваней. Полотенца меняются по требованию. В целом the best!!! Просто небольшое пожелание к администрации: хотелось чтобы ванна и туалет были чуть чище и проверялся сток воды к приезду каждого из отдыхающих. Мы понимаем конвеер, много отдыхающих, но не обижайтесь. Цены бы ещё поприятнее. By arrangement, you can order 3 meals a day. A grocery store, a cafe and a spacious summer area are open 24 hours a day. 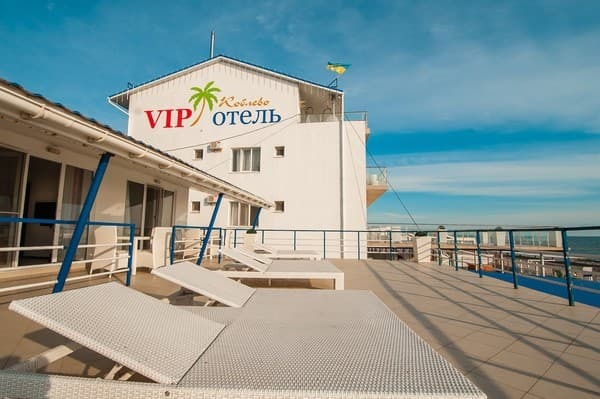 "VIP-hotel" is located 25 meters from the sea and 4 km from the Odessa-Nikolaev highway. The distance to the city of Nikolaev is 87 km, Odessa - 64 km. From Odessa: from the suburban bus station (near the "Privoz") - a fixed-route taxi to the bus station of the resort zone Koblevo (base "Blue Torch"). From Nikolaev: from the railway or bus station - a fixed-route taxi to the bus station of the resort zone of Koblevo (base "Blue Torch").